There is much to see that is edgy at the Edinburgh Fringe. Clowning is presented in many forms, and is integrated into many adult-themed shows. And that is why it is so nice to see an old-fashioned children’s show, as a welcome juxtaposition. Patty the Clown is energetic and welcoming, singing her original songs and encouraging children to join in and sing along. By the end of the show, even the youngest kids were out of their seats and bopping along to ‘Clownercize’. Dandy is another talented clown, and his comedy magic – while a bit old-fashioned – was accompanied by witty patter and enjoyed by parents and children alike. 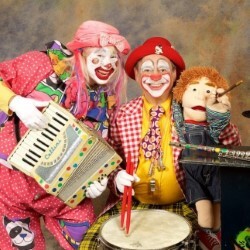 A great choice for younger fringers, this Canadian clown duo is sure to delight.